Plans for a wind farm in northern Gage and southern Lancaster counties that failed to materialize may be resurrected by a different company . . . NextEra anticipates the $141 million project would create around 200 jobs during construction and generate more than $25 million in property taxes over a 30-year period. The company is planning two informational events to discuss the project with the public. The events will both be at the Hallam Auditorium at 15 Main St. in Hallam on Tuesday, Oct. 9 from 5-7 p.m. and Wednesday, Oct. 10 from 7:30-9:30 a.m.
Photo: NextEra’s first Nebraska wind project was the 75-megawatt Steele Flats Wind Farm in Gage and Jefferson counties consisting of forty-four 1.7-megawatt turbines. 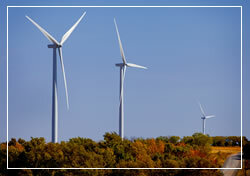 The wind farm began commercial operation in 2013. This entry was posted in Nebraska / Midwest News and tagged Beatrice Daily Sun, economic benefits of renewable energy development, Gage County, Lancaster County, NextEra Energy Resources, The Blue Prairie Wind Project on October 2, 2018 by Helen Deffenbacher.